Somender singhs groove theory tried. I've tried his grooves on a 530 and with 25 degrees static advance and could not get the engine to ping/knock under any load/speed combination, in my experience anything over 15 degrees produced high load low rev knock on a normal head, the engine set at 10 degrees static advance (normal) will pull happily down to 1000 revs in 5th and thats with a bad exhaust leak, i can't comment for the moment on fuel economy and high rev power because of the exhaust, i've took it up to a hundred and it seemed ok.
Do you have pictures of what you've done? Yes but i'm out at the moment, les. I've been waiting to see if someone would try this. I was about to ask you what boost you were running, but being that I'm such a sloppy reader, I didn't notice that it's NA. My main concern with this mod (and it may not be a concern at all) is how much meat is below the groove that seperates the groove from the cylinder head water jacket... again, it may not be an issue. Personally, I would hold off on modding the 531 till you actually added the turbo to your car, but that's just me. post pics when you can... I'm curious to see what it looks like. I also think this should be moved to performance. Personally I think the only benefit might be the ability to run cheap gas for economy, but it is a modification, so off it goes. you could take more advantage from the mod by raising the static CR. (skim the head or block) It would be interesting to see how far you can go with that! interesting - how much the CR has lowered is also a factor in pinging - so on cars where you cant adjust the timing - how will we take advantage of this ? Removing the material for the groove does lower static CR, any guesses on how much? I guess since heads are so cheap, you frequent parts swappers should try some testing. I only take my motor apart once a decade, so it will be a while for me to test this out. Bearing in mind that I can run that timing with 87 octane and a stock engine on MSnS-E (up to about 2PSI), I'm not super impressed. Upping the static CR to 12:1, running normal timing, now THAT would be cool. Similarly, running stock B230F (or FT) CR, cheap gas, and more in-boost timing would be a great leap forward. I'm in no way badmouthing your efforts; in fact, I applaud them - I too have oft wondered what the grooving could do. But it's a trip and a half that you don't see ricers/modders/hotrodders doing the grooves... they're well publicised. Interesting mod. I winder what problems it will have under boost. That groove leaves alot of peaks and shart edges, perfect for hot spots, which in my education, cause pre-ignition. Tell us how it works out for you when turbo'd, you got my interest. If someone who can put the pics on can pm their email everyone can see my efforts, please bear in mind i know as much about this as you guys, about the timing advance, my engine kicks back on the starter at more than that, also it's definately losing top end performance being advanced 60 degrees, i'm not running mega squirt i've only got a simple stromberg carb but i can assure you my fuel mixture was about 13.5 give or take .5, i know you mega boys can get your fuel mixtures smack on but for my purposes it's close enough, as for hot spots, i was also worried by that, so i removed all sharp edges with a needle file, i know on the website they say not to remove them, but i did anyway. The head is off a 89 gle with a 230e so i would assume the compression ratio is around 10.00 less the material removed for the grooves, there are much better technical people than me on the board that can guess the amount it's gone down, if this method can be proved to help with detonation the benefits should be obvious to everyone who wishes to run engines at higher than stock power levels, if it turns out to be a crock of **** then no harm done. Les. and unless he trenched the head, I doubt that it lowered the CR very much. The difference in CR NA to turbo comes from the bathtub pistons that are in a turbo motor. I cut the main grooves more or less level with the bottom of the combustion chamber in a straight line to level with the top of the squish area about 3/16ths in from the gasket ring, i'm afraid the first one on number one piston area got a bit close to the ring and i was a bit more careful after that, the smaller grooves are about half depth. As i see it (just a theory you understand) the walls of the combustion chamber act as a barrier to the flame front, tight squish improves things by leaving less unburnt fuel in the squish area and so reduces the chances of detonation, the grooves actually encourage the flame into the squish area leading to a more complete burn and that's why the squish clearance needs to be around 70 thou so there is enough fuel in the squish area to provide a consistant burn, otherwise a clearence of 70 thou would actually aggravate the engines tendency to detonate, alternate theories welcome. Awesome! Someone beat me to it. I have a 530 on the way that I'm going to do the exact same thing to. I PM'd Fred (fpre: The chip guy) about burning a different ignition chip with revised timing to take advantage of the grooves but it doesn't look like he'll be able to do so. You MS guys certainly have the advantage here. Kenny: Would you be capable of burning an ignition chip that could take advantage of this mod? Les: Did you only do one groove for now? Also, how deep did you make yours? I don't want to cut too deep and ruin the head. 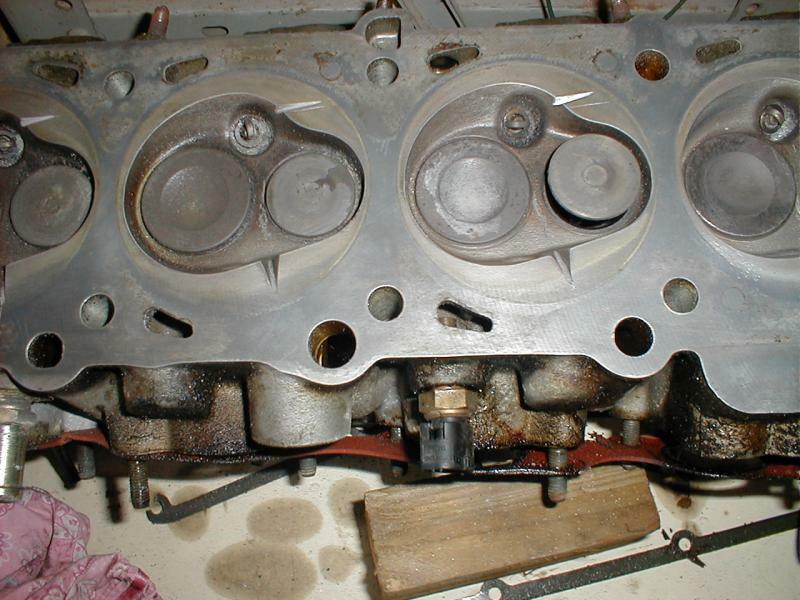 I have a ported 530 that I wanted to do the same thing too based on how my trial head worked out. However, if you are seeing success with B230's, I may skip the trial and go straight to my ported 530. Nice work ripper. I was about to do the grooves and test then post back, but it looks like I'm about to get some good info about it without doing it myself. Here is a great explanation that I found on mpgresearch.com if I'm not mistaken. Edit: The above link is wrong. Here it is. 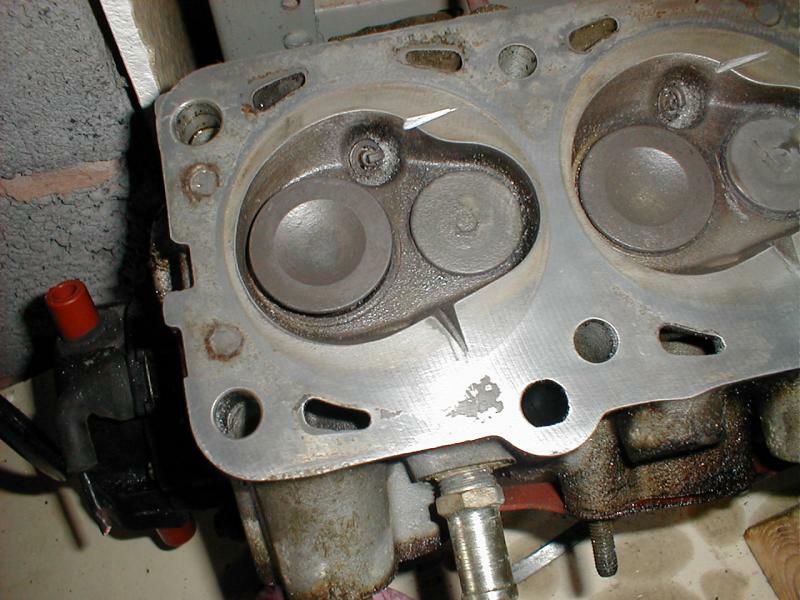 The shape of the piston and cylinder head have their greatest affects on combustion efficiency when the piston is within about 10 mm of Top Dead Center (TDC). 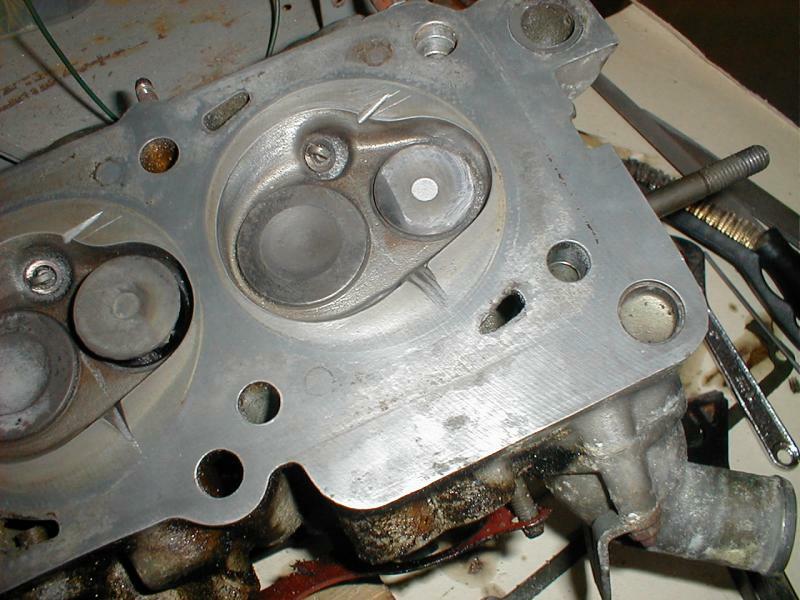 When the piston is more than 10 mm away from TDC, the cylinder head and pistons are just distant and innefectual walls bordering a large open expanse. So the grooves do their work within this 10 mm range. On the compression stroke, they force the compressing air/fuel charge into the quench area via higher velocity jet streams to better vaporize and homogenize the fuel. On the power stroke, they guide the explosion through these same jet streams but in reverse to create vorticies, to clean out the ring lands, and to some greater or lesser degree further excite the flame front. Here is a good thread at mpgresearch.com that some may be interested in. The squish area sends a flat jet of air into the chamber, causing turbulence, increasing fuel and air mixing and complete burn. Grooves change the shape of the jet. The grooves can't "cause" flame to propagate into the squish are any better than a flat area. mikep is right as always, but its interesting to consider the dynamics involved, what i'm picturing in my head stock vs cut would seem to indicate benefits from having the cuts. Wonder if more but smaller cuts would do better? I will speak to some people tomorrow and figure something out. I want to make some experiments too, not only with this subject of "grooving" the head, but also by making a more advanced ignition chip. All for the good of the Turbobricks community . There are some good photo's on somenders site that show the burn pattern extending right into the squish area, is this normal?, i'm out of my depth regarding burn patterns etc. Wow!- I was waiting for somebody to do this. Mike H.(740ATL) and I were just talking about this yesterday. 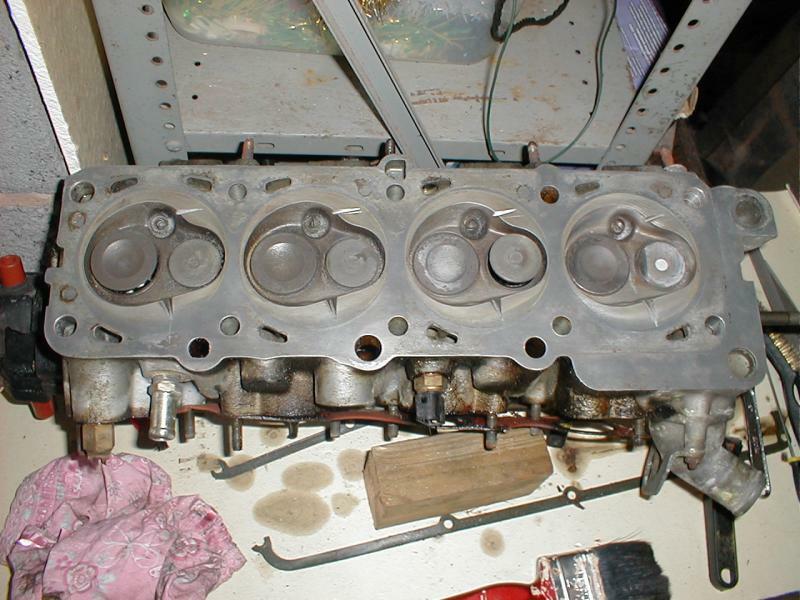 Keep us updated- I have a 530 head I wil try this on a B23ft. Maybe a dyno run before and after would be in order. this is awesome. I have been wanting to do this as well. Im glad someone took the plunge. Now... everybody get to cuttin! I got this photo of a Volvo combustion chamber from a Bilsport article posted here. See those divots in the side of the chamber? Used to create turbulence for a better burn is what I was informed they are for by folks here on the board. Putting in a turbulence causing area is probably something manufacturers have used for a long time. Hope the experiment works well for ya Les.